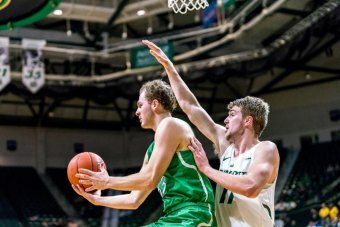 DENTON, Texas – Jon Elmore broke the Conference USA scoring record as Marshall men's basketball (16-13, 9-7 C-USA) rides hot-shooting second-half comeback to take down North Texas (20-10, 8-9 C-USA), 85-82, in Denton Sunday afternoon. Elmore finished with 20 points on his historic night to go with six rebounds, a pair of assists and a pair of steals. The senior went six-of-12 from field and made five of his eight three-point attempts. Jarrod West tied Elmore for the team-high in boards with six. C.J. Burks scored a game-high 21 points in the contest to go with a team-high four helpers. Burks went eight-for-11 from the field and added two takeaways to his stat line in the win. Taevion Kinsey brought up the rear of a trio of Marshall players in double-figures with 19 points off the bench. Kinsey shot six-of-10 from the field, made a pair of threes and made five of his seven attempts at the charity-stripe. Rondale Watson and Mikel Beyers tied for the game-high in blocks with a pair of rejections each. The Herd came out slow as the Mean Green started the contest on a 13-0 run and Marshall missed its first five field-goal attempts. Marshall trailed 26-13 with 9:07 on the clock as Elmore went to the line to shoot three free throws after being fouled on a three-point attempt. The senior drained all three, as part of his 20-point night, with third cementing him as the all-time leading scorer in Conference USA history passing UTEP's Stefon Jackson. Elmore then made a three as the Herd went on a 12-3, along with threes by West and Beyers, to pull within four with 7:05 left in the opening frame. The Mean Green eventually had a 12-point lead, 43-31 heading into the break. The Mean Green briefly regained the lead, but Marshall retook around half-way through the second half and didn't relinquish it the rest of the way. The Herd never lead by more than nine points in the game, but a pair of Kinsey free throws sealed the deal with 10 ticks on the clock. Marshall scored more points off the bench, 31-11, and second-chance points, 13-6, than North Texas. The Herd shot 67.9 percent (19-28) from the field in the second half. - The marked the first road sweep for Marshall in conference play since winning games on Jan. 3 at Old Dominion and Jan. 5 at Charlotte. - The 12-point half-time deficit was the largest overcome by the Herd this season. - Marshall made an overall comeback of 14 points, the second-largest comeback of the season for the Herd. - The Herd's comeback marked just the third halftime deficit overcome this season. - This was the sixth contest that the Herd have had more second-chance points than its opponents. - It was the sixth win on a televised game this season by Marshall. - Kinsey scored 13 of his 19 points in the second half. - Elmore had made 25 consecutive free-throw attempts before missing his final two attempts with 0.7 seconds left in the game. - Burks scored 12 points in the second half. - The Herd had four players with five or more rebounds. Marshall returns home for a contest against FIU Wednesday night in the Henderson Center. For all the latest information about Marshall men's basketball, follow @HerdMBB on Twitter and Instagram. To follow all Thundering Herd sports and get live stats, schedules and free live audio, download the Marshall Athletics App for iOS and Android.